Your child’s education begins at home with you. Learning to be a better parent begins with El Concilio. 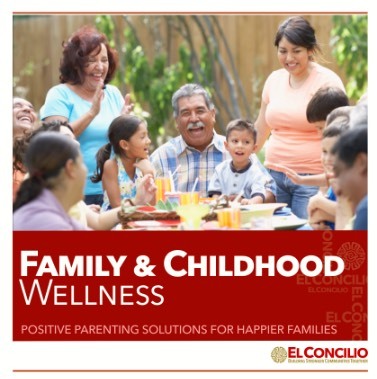 El Concilio’s Family & Childhood Wellness department services and programs are a key strategy for supporting families with young children and beyond. We believe a community is stronger when children are raised in a supportive, nurturing environment so that they can live happy, productive lives. Our home visitation and parent engagement programs empower parents through education and community support. Participating parents learn how to recognize and respond to their children’s changing developmental needs, use positive discipline techniques, cope with the day-to-day stress of parenting in healthy ways, and set and achieve short- and long-term goals. Our various family wellness programs are free and voluntary, culturally sensitive and bilingual, providing families with meaningful information on parenting and child development. Engaged parents and healthy child development. Our staff of certified parent educators, home visitors, and promotores are a part of a comprehensive and coordinated system of services. Strength-based, family-centered, and culturally sensitive, our programs are designed to promote positive parent-child relationships and healthy attachments. We foster the growth of happy and healthy children. We know Parenting is a daily learning experience. Parenting is one of the most complex and challenging jobs you will face in your lifetime – and also the most rewarding. El Concilio is dedicated to guiding parents in raising confident, kind, resilient kids. Our programs transform not only the families we serve but the communities they live in by delivering distinctive services that help children thrive and strengthen families. Our home visitation services are planned instructions and one-on-one consulting that is proven to be effective in helping families. Using the Parents As Teachers curriculum, our certified parent educators provide parents with tools to promote their children’s healthy development and emotional well-being; while the Health Education curricula educates families on eating healthy, being physically active, and managing the household budget. We accept referrals to our Home Visitation programs for families living in San Joaquin County that are expecting a baby or have a child under 5 years, or for parents enrolled in CalWORKs. Healthy Families is a six-part, interactive, nutrition workshop program that teaches parents about healthy eating and shopping, cooking demonstrations, home gardening, the value of exercise, plus CalFresh education and enrollment, as well as diabetes, cardio- vascular and oral health education and awareness. We understand that a hospital stay can be confusing and stressful, especially when you do not speak English. In SJC Hospital Maternity and Pediatric department, our Patient Advocates provide translation assistance between Spanish-speaking mothers, hospital staff and the doctor during delivery and parents of pediatric patients. They also help with birth certificate completion, admission and discharge paperwork, and also provide “stork tours” for expectant mothers.